After releasing a test return capsule, the service module is headed for Moon orbit after loitering at Earth-Moon L2. A Chinese spacecraft service module has entered orbit around the moon, months after being used in the country's landmark test flight that sent a prototype sample-return capsule on a flight around the moon and returned it to Earth. The service module from China's circumlunar test flight arrived in orbit around the moon this week, according to Chinese state media reports. The spacecraft is currently flying in an eight-hour orbit that carries it within 125 miles (200 kilometers) of the lunar surface at its closest point, and out to a range of 3,293 miles (5,300 km) at its highest point. Earlier reports noted that a camera system is onboard the service module, designed to assist in identifying future landing spots for the Chang'e 5 mission that will return lunar samples back to Earth in the 2017 time frame. China's test lunar orbiter launched on Oct. 24, circling the moon during its eight-day mission. The service module ejected a return capsule on Nov. 1, with the capsule parachuting to Earth that same day. 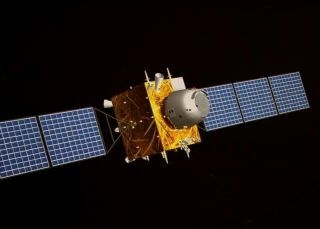 "It was the first time for a Chinese spacecraft to reach the L2 point, and the service module completed three circles around the point, expanding probe missions," said Zhao Wenbo, vice director of China’s State Administration of Science, Technology and Industry for National Defense (SASTIND), according to the according to the state-run Xinhua news agency last week. According to ground controllers, the service module contains support systems that reportedly are all operating smoothly. The module now orbiting the moon is loaded with gear to collect further data useful in planning China's Chang'e 5 lunar mission set for 2017, said state broadcaster, China Central Television. Chang'e 5 would be a robotic sample-return mission aimed at making a soft landing on the moon and then scooping up several pounds of lunar rocks and soil for the return trip to Earth. Leonard David has been reporting on the space industry for more than five decades. He is former director of research for the National Commission on Space and is co-author of Buzz Aldrin's 2013 book, "Mission to Mars – My Vision for Space Exploration," published by National Geographic. Follow us @Spacedotcom, Facebook and Google+.